Most of us with or without complaints of neck or back pain have heard the term a "herniated disc," although we may be not completely clear on exactly what this means. The intervertebral disc is a shock absorbing structure which lies between 2 adjacent vertebral bodies in the spine. It is composed of an outer protective layer of collagen called the annulus fibrosis as well as the inner nucleus pulposus. The nucleus is comprised mainly of water as well as inflammatory chemical mediators, such as phospholipase A2, cyclooxygenase, and nitrous oxide. Activities which include or require prolonged sitting, forward bending, stooping, and twisting place a mechanical load on the intervertebral disc. Forceful and/or repetitive spinal movement in this regard can lead to a fissuring or tearing of the annulus fibrosis. This process may be relatively asymptomatic, although can lead to complaints of axial spinal pain referred to as internal disc disruption syndrome. When this occurs, the outer annulus fibrosis is weakened leading to a loss of structural integrity of the nucleus pulposis as well. The nucleus can shift, or bulge, towards one or more sides of the annulus fibrosus. This is seen in 50 percent of all people without complaints of low back pain, however can be symptomatic in selected patient's. When the nucleus pulposis ruptures through the annular tear, this is referred to as a herniated disc. This can be further subclassified as a disc protrusion, disc extrusion, or disc sequestration depending upon the size and location of the herniated nuclear material. Although potentially a source of pain, herniated disks can also be seen in approximately 30 percent of all people without complaints of low back pain, justifying an appropriate history and physical examination by a spine practitioner. 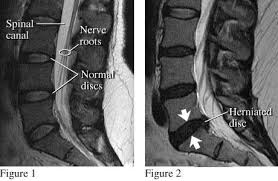 Although direct irritation and/or compression of the adjacent nerve roots can occur by herniated disc material, it is believed that this can be asymptomatic depending upon the degree of additional inflammation. It is because of this very reason that the typical preferred approach to treating any patient with pain consistent with a herniated disc is conservative, focusing on reducing inflammation, strengthening, and improving mobility and function typically through comprehensive rehabilitation.